Arm numbness and entire upper back tightness makes for a diagnostic conundrum. At the beginning of the year I was driving and the right side of my body suddenly became numb. I thought I might be having a stroke. Went to the er and that was discounted as I had only sensory and not any motor involvement. Since then I have experienced bouts of the same symptoms and a generalized tightness in my upper back, shoulders and underarm area (transient). I have had problems before with my right rhomboid muscle and it has been very sore so I assumed the problem was coming from there (irritated nerve?). I have seen a chiropractor with little change. I would think this would have gotten better by now. It's scary at night when the numbness sets in. I have had a stroke three yrs ago and that reminds me of that. I recovered fully as I am somewhat of a health nut, the last person anyone thought would have one. Also, I notice a stiffness and limited range of motion in my toes. Any insight into these issues would be most sincerely appreciated! Thank you! Good day Dr Jim, and you have posed an interesting question. The diagnosis obviously is paramount. Do you know if you have any increased reflexes, and whether there was any change in them in the last month. Some central involvement is more likely than a cervical spine issue which would not cause the whole of your right side of your body to become numb. The exception would be advanced cervical spine stenosis, when cord impingement is possible. Again, increased reflexes, especially in the lower limb. If it was coming from your neck, then movements of your neck will usually provoke pain, and often radiating signs down the arm, or into the midback. If you turn your head to the right, and then look up, what happens? 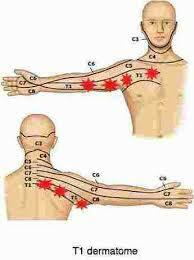 The T1 dermatome covers the upper back and the under arm. Do you have any weakness in the fingers. If you sqeeze a piece of paper between your index and middle finger, and pull it away with the other hand, what happens? Is right and left equally strong? With a pinched nerve in the neck, you would have a positive upper limb tension test. Find it using the search function at Chiropractic Help? You need a helper to do the test. One other question concerns the position of your arm. If you raise it above your head, as in screwing in a light bulb, does it increase or lessen the numbness? If you carry a brief case in your right arm, does it increase the ache in your arm? Upper back pain is always difficult. The skin is supplied to T1-3, but the underlying rhomboid muscles are pure C5. You make no mention of x-rays of your neck; is there anything significant? Summing up, if movements of your head to not provoke the numbness, the ULTT is negative, there's no weakness or decreased reflexes in the arm, then I think a neurologist is the right way to go. I hope this contributes. Join in and write your own page! It's easy to do. How? Simply click here to return to Chiropractic help Questions (Neck pain).